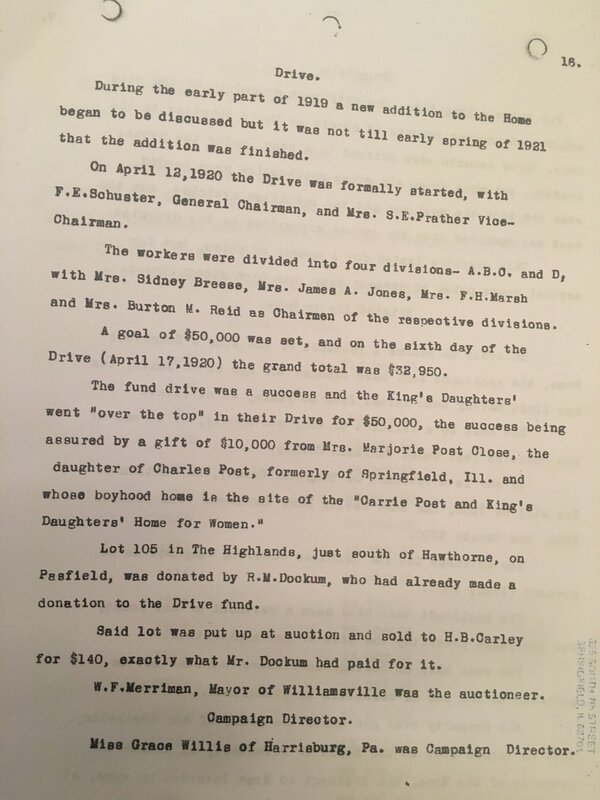 Please take a moment to read over the fundraising brochure used and pieces of Mary E. Hansell’s 1928 History which describes the April 12-19 Drive and how Mrs. Marjorie Post Close's $10,000 donation at the time of The Drive, put the amount raised for the addition, "over the top." The success of the Drive allowed the expansion of the Home. The New Addition section of the History tells us that the addition was built on the west side of the old building and part of the same structure with 20 bedrooms for the "inmates", two hospital rooms with nurses’ room adjoining, a diet kitchen, office, matron's room with a private bath, two rooms for the help with bath and rest room, a room for Board meetings, new kitchen and dining room and four bathrooms. One of the most beautiful things about these writings is the snapshot it gives of what the Home was like in 1920. The Home at this time had been around almost 28 years and was a home for 19 aged women, with 18 on the waiting list, all over 65 years old. During previous years it had provided a home for 68 women that otherwise would have not had a home. An interest note is that there were 23 King's Daughters circles of non-sectarian- or no specific religious affiliation. The endowments at this time was $47,400. They had striven for an ideal - to be a real home, not an institution. These are women in their declining years, entitled to a home, home comforts and care, home surroundings and all the happiness that a real home can give them. In the Conclusion section we see that since the Home started it has become a popular charity, and, during late years, hardly a wealthy person has made a will without generously remembering the King's Daughters Home. These two pieces give us a wonderful ”snapshot" of the 1920's in relation to both raising money and life in the King's Daughters home; so take a few minutes and check them both out! The writing and descriptions are priceless. King's Daughters Organization is a registered 501c(3) nonprofit serving the Springfield, Illinois area.